My mistake ordering. Friendly no hassle return. Loads of Fun! My Son LOVES it! At you it has been specified that the goods are to America, and now in China!!! 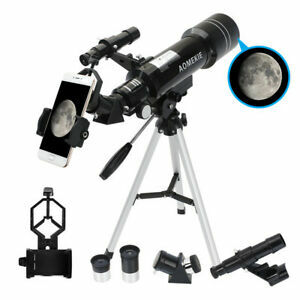 This is nice little telescope for a beginner. I bought it for my 4 year old just for us to play with. He loves it! The phone attachment is a brilliant feature to help little eyes. The use and adjustments were super easy for me to figure out and Ive never owned a telescope before. The only thing that really could use some improvement is the tripod, it’s pretty small so we use a table to set up on. All in all great little telescope. It also functions great as spotting scope for hunting, it’s great a gathering light. Not worth that money. nice toy and that's all. It is just a toy, not a telescope. Good for watching neighbours and birds, but moon or stars you can forget. Tripod is almost immposible to move in all direction slowly, and after that you need 5-10 seconds to stop shaking. than if you want to adjust picture, again wait until it stops moving. Stronger ocular is worthless and weaker is ok but not for stars. Even you can't normally watch moon. This is a very beginner telescope I will refer him as a toy. The clearly whit the 25mm eyepiece is good but the 6 mm eyepiece is not clear at all and is not useful. Its can be good to see the moon but not enough to see ouer solar system planets. The bottom line: not cheap for its low quality components. This is an excellent set up for a beginner or child. The phone adapter is perfect for a youngster that can't yet wink. Our daughter is 5 years old and loves that she can now see what we can see. It's great for starting out and learning the basics. Additional lenses are great and hard cases are included for storing when not using. Easy to switch out the different lens too. Out of the box and assembled withing 10 minutes.